Inspired by human medicine. And sea turtles. The year was 1996. Most medical and veterinary practices weren’t yet computerized. Practice management software was so new that a small one-doctor medical practice had to pay $50,000 for a software system. Also in 1996, Americans were first beginning to access the Internet through dial-up modems. Speed was slow compared to today’s standards, but medical practitioners still got a spark in their eyes when they realized how quickly they could access information with just a few keystrokes. At that time, I was working with CureMD, a software development company for the human medical market. We thought, why can’t we deliver practice management software more economically over the web for those smaller medical practices? So we built the first cloud-based practice management system in the human medical market. And today, CureMD is still used. In fact, it has been ranked the best-selling cloud system for small medical practices for three years in a row. Ten years later, in 2006, a veterinary practice in New York asked us to design an electronic medical record for the clinic. As we explored the veterinary industry further, we noticed several practice management systems already available. But they were lacking in clinical data management capabilities compared with their medical industry counterparts. Unlike the medical industry, the veterinary industry had no widespread use of standard diagnosis codes to allow for easy reporting. Medical conditions could have any number of descriptions depending on who entered the information at the clinic. If a practice manager tried to run a report on all patients with a certain condition, results would come back spotty, if at all. Another thing we noticed – veterinary practice management software platforms are primarily focused on practice financials and tracking the sale of goods and services, not capturing clinical data or sharing medical records between practices, such as when a patient is referred to a specialty clinic by a general practice. There’s no ability to share medical records between clinics. So we thought, how can we create a system where medical records can be sorted, analyzed, and shared between veterinary clinics, similar to human medicine? And are there other areas where we can bring best practices from the human medical industry to improve practice management for veterinarians? Patterson Veterinary had a similar vision … to provide a strong clinical practice management system for veterinarians that would allow open integrations with all of the other services that a veterinary practice needs to operate – wellness plans, marketing services, pet insurance carriers, accounting software, and more. So we joined forces to create a cloud-based veterinary practice management system that would meet those needs in an affordable, convenient way. Rather than taking an existing server-based software and making it cloud-friendly, we would build the software from the cloud up, with a natural, intuitive workflow. We know logging into several systems throughout the day to manage all aspects of a veterinary practice is a struggle when you’re trying to treat enough patients to run a profitable business. So why can’t practice management software manage everything? Patient medical records, marketing campaigns, a practice website, bookkeeping, and more. 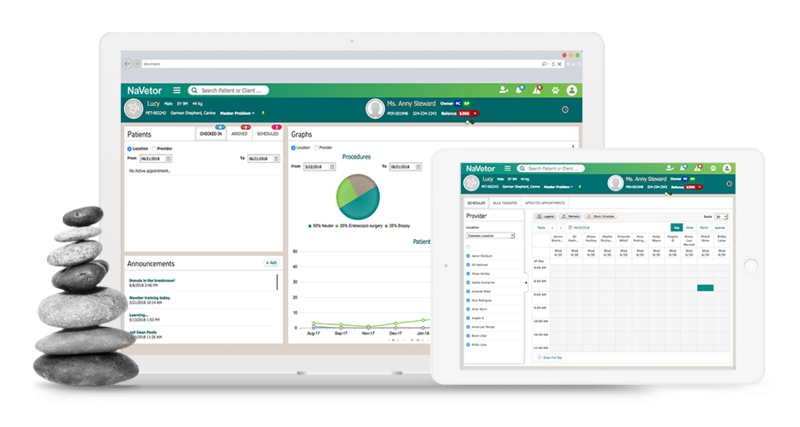 Our goal is to allow veterinary practitioners to log in to their practice management software and stay there all day. Borrows best practices from electronic medical records in human medicine. Using standard medical codes and descriptions so medical records can be completed quickly and data can be organized and analyzed in a matter of minutes. It’s “meaningful use” for veterinary medicine. Leverages the power of the cloud. Practitioners can access practice information at any time, from any device. Practices running cloud software don’t have to worry about managing heavy IT systems. The Internet today is not the same as in 1996 … it’s much more reliable and secure and allows convenient and affordable access to practice management software. That, in a nutshell, is why we created NaVetor. Over time we’ll be adding more and more features and integrations as we continue to develop and support the software. And that’s how we got the inspiration for the turtle in the NaVetor logo. No, the turtle doesn’t signify “slow.” The sea turtle is actually nature’s best navigator, using the earth’s magnetic field to find its way back to the same beach where it was born, after years of migration. We hope NaVetor will do for you what the sea turtle’s natural instinct does for it … help you find your way to achieve a streamlined, efficient, more profitable practice. Stay tuned! Ali Hashmat is CEO of CurePartners, a provider of practice management software and services that transform the administrative and clinical operations of veterinary organizations. He is responsible for all aspects of veterinary software development as well as the partnership with Patterson Veterinary. I am interested in learning the cost per month for a one-DVM mobile practice. Certainly! We’ll have one of our sales team members reach out to you. You can also email them directly at sales@navetor.com. We are interested in learning more about your practice management software and how it compares to others. Looking forward to trying out a demo, ASAP. Thank you!